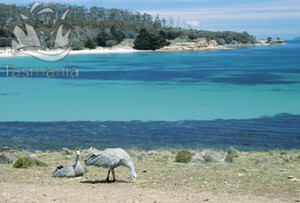 Maria Island Tasmania is a beautiful place to visit. 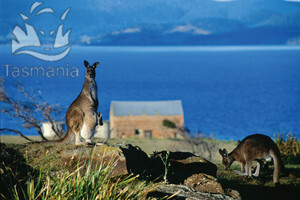 Maria Island off the east coast of Tasmania is one of Australia’s great secrets. With its rugged cliffs, beaches and kangaroos, fossil rocks, and some great bushwalks with views over the blue ocean, it is a wonder that Maria Island is still not crowded with travellers. 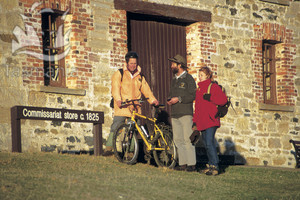 Here is some information about the island and its bushwalks, and in the end of the page there is a Maria Island map. In the northern end of the island is the historical Darlington. It’s an interesting place to discover with some old buildings and ruins from the 1800s when a few people tried to establish vineyards and a cement industry here. At one stage the population was big enough for a shop, a hotel (pub), a school and other buildings to be built. But the industries were knocked back by the 1890s and 1930s depressions and people finally left. If you like history, you’ll enjoy spending a few days here. 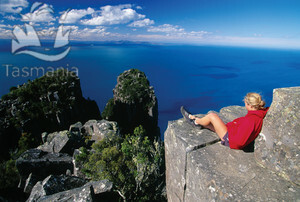 East of Darlington is one of the shorter but more demanding bushwalks to the Bishop and Clerk. It’s a nice walk which goes constantly uphill to the 599m mountaintop of Bishop and Clerk, but the views from up here are worth the climb. There are no camping grounds here but you’ll easily manage to walk back the same day. Don’t miss the Fossil Cliffs on the Fossil Beach which can also be visited on short walks from Darlington. 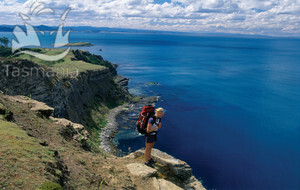 The other, longer bushwalk of Maria Island goes south from Darlington. You first come to the Hopground Beach with the famous Jurassic sandstone Painted Cliffs, and further south are the Four Mile Beach and Booming Bay, before you come to Frenchs Farm – one of the island’s three camping grounds. By AllPosters. Click on thumbnail to buy. Southwest is another camping ground at the Escarpment Cove and nearby you can visit some old ruins. Further south is the isthmus between Shoal Bay in west and Riedle Bay in east, before the walk goes to the southern part of the island and ends in Haunted Bay. From here you walk the same way back across the isthmus, until, after the French Farm camping ground, you can turn right on a crossroad and walk the inland way past Ned Ryans Hill (instead of the coastal track that you’ve already made). From this path you can also turn right and walk to the 711-m Mt Maria, where there are some great views. Further north near Toarra Hill there are some more old ruins before you get back to Darlington. You can get to the island by the Maria Island Ferry from Triabunna. As the island is still quiet and not very known for travellers, there are not many guided tours either. There is one however, Maria Island Walk, and it’s a new tour company that does four-day trips to the island, supposedly very well organised. Here's a Maria Island Map, where I have tagged the places that I mentioned on this web page. You can click on the tags to see what places they are, and double-click anywhere on the map to zoom it in and see the places closer. Drag the map to move around, and if you want to see the satellite image with Google Earth, click on "Sat" in the top right hand corner.